Travel Mate（旅行伴侣）, a excellent app developed by MMMOOO has received a Second Prize in the competition held by Nokia China & China Mobile Market. Travel Mate is aimed at helping people who are traveling abroad with a lot of necessary tools, such as map, location, translation etc. When you are traveling outside, Travel Mate is much like a helper more than a tool. It will help you to remember what you plan to do and keep you informed of exchange rate. In a word, Travel Mate is absolutely a nice app that will help you a lot in your daily life. In Traveler mode, it enhances you to talk to local people with your own language, Translator will recognise your voice and translate it into local speech, then talk to local people. In return, local people can speak local language to Translator, and you will get your language speech or text. Travel in a place, then you can easily use the wiki search to explore some detail in local. Even more you can see what arounds you in the map with Wiki database. 500+ frequent dialogues in 7 languages with search function. Each conversation with BIG ZOOM IN, speech, and some with 'read as', your travel just no boundary. Translator - Your best pal in translating, language learning, Wiki exploring, traveling abroad. when you travel abroad you can use this tool to make conversation with local people with the voice input/output, translation. ②Wiki Search & Wiki in Map Travel in a place, then you can easily use the wiki search to explore some detail in local. Even more you can see what arounds you in the map with Wiki database. ③Conversation for Travel Abroad 500+ frequent dialogues in 7 languages with search function. Each conversation with BIG ZOOM IN, speech, and some with 'read as', your travel just no boundary. Good Emma - A Good friend for children! Is going to realease on BlackBerry 10 this month! Good Emma can be a smart friend who can develop a good friendship with children! Touch her, beat her in different positions, and see what will happen. Good Emma is made of 3D cartoon design. Emma will behave agilely when in different situations. Moreover, Emma will share commen sense of safety with children which may help you a lot in early education. 1. Emma character is created by 3D Maya, looks really smooth: 2. Inspired by my 5 years-old daught, will be your kids' good friend! 3. Emma teaches children in a healthy & funny growing map. 4. Animations are original and from normal life, attractive for little kids! What the most important is, Emma is coming to be available on BlackBerry 10！Do you love her ? Wallpaper sky is the best cross-platform wallpaper application, what I say, a perfect app! With it, you can download all the hottest, newest, and editor pick wallpapers, all are in high quality! And we will keep on these SUPER HD contents update everyday! 처음에는 사실 그냥 속는셈치고 받아보자는 생각에 다운받았는데 ㅋ 정말 좋은앱이네요** 제가 맘에드는 배경화면을 다운 받을 수 있으니까 따로 다운 받을필요가 없어서 좋네요! Works well on my 9900, love the wallpaper, all are awesome and free!! :) Thanks MMMOOO. 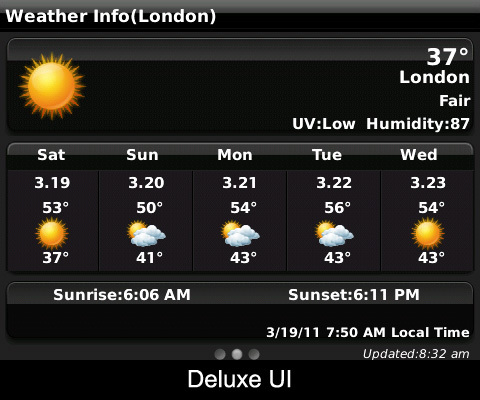 Works fantastic on Bold 9900. Great wallpapers... Must have for all who make frequent changes to their wallpapers. A professional recorder which can help you to record your voice notes or other recording files, and after that, you can backup the recorded audio file on cloud server(skydrive), or on local computer via WLAN. If you want to share the audio file on SNS, it is also very convenient, just bundle your SNS account(Sina Weibo, Tecent Weibo), then one key to share! If in a vocal concert, you can record the live music and share them on your SNS to impress your friends! **No.1 in Photo for months! Ultimate fun and functional**, PhotoClub enables your BlackBerry® as a funny make machine with photos! It includes Adjust Photo, Add Clipart, Add Frames, Add Effect and Add Custom Elements these useful and funny functions. Due to more than 5000 users' nice feedback, and more than 10000's giveaway, we ended the giveaway campaign, be so KIND to understand this, it's a deserved app for you.We will keep on updating to serve you. Easy to use, speedy in operation. Fixed the Bug - After doing 'crop', the screen become white. Support BlackBerry® 'Back' Button. Add 5 new cliparts and 5 elegant Frames. Add 2 kinds of new Effects - Sephia & Scence. Support getting cliparts and frames online. Shortcuts for movement, pixel by pixel movement via 'alt+navi', speedy movement via 'shift+navi'. You may resize the photo firstly to enjoy a speedy and smooth operation. Custom elements must be in transparent .png format. To move a clipart or photo in QWERTY models , via 'alt+navi', speedy movement via 'shift+navi'. A：You couldClick hereto purchase directly. Or go our “Store” (Click the Navigation bar “Store", and click "Blackberry Tab";), Then find out "Photoclub". If you want to purchase the full verison, please click the image "Pay with Paypal", and then in the new page, input your phone PIN number and Email, and done the payment process. If you want to experice the FREE trial at first, please click "Free Download", and input youe email address in the new page, then system will push the download link to you mail box immediately. A：The Activate is based on your phone PIN, so please make sure you have input a correct PIN number in your purchasing process, (To check your PIN, please go your phone "Options" >> "Status" >> "PIN") After installation, Please enter the app by pressing icon, and press Blackberry Key, in the pup-up menu, select "Registration", make sure your network is working, and afte few seconds, there will be an notifiers"Register Successfulluy", then the app has been activated to full version. If you have completed payment, but could not activate, please do not worry, kindly contact our customer service team: cs(at)mmmooo.com, we will provide dedicate service. ***Regional Selections Winners of 2010 BlackBerry(R) Super Apps Challenge The Creator & Founder of Push weather info to homescreen. *This version released around 10 March; ONLY available for 5.0 or above models Be sure to delete former file then to update this new version. 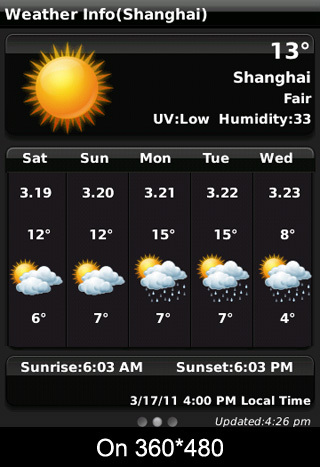 Place weather info directly on your home screen, NO NEED FOR A WEATHER SLOT IN THE THEME. 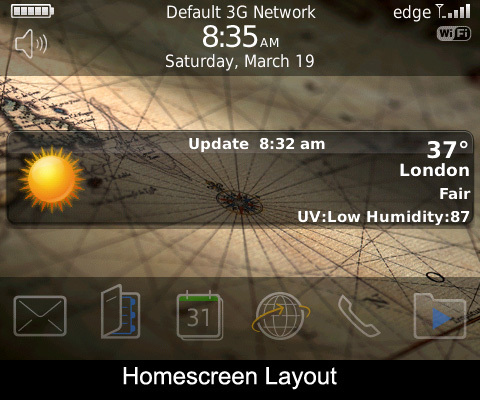 Weather plus enables you to put weather info both on your home screen and the icon. The most convenient weather app ever! Now comes to version 2.0.0 with more humanity functions. 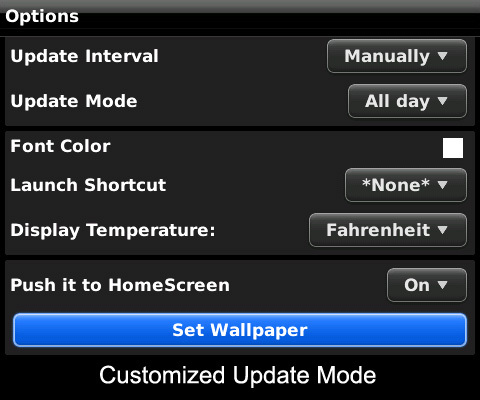 Five display mode for home screen. Search city by ZIP (US only). Improved steady & smooth connection. Customized Shortcut key enabled . Enhanced Icon info: temperature and condition informed. If you want to select system sample pictures as wallpaper, please go to your picture folder found out the picture and open, then press BlackBerry(R) key, in the pop-up, select 'Set as Weather Plus wallpaper'. Add an version control module this time!!! From now on, when there is an upgrade, you could check it in the menu of this app, and get download link. A：You couldClick hereto purchase directly. 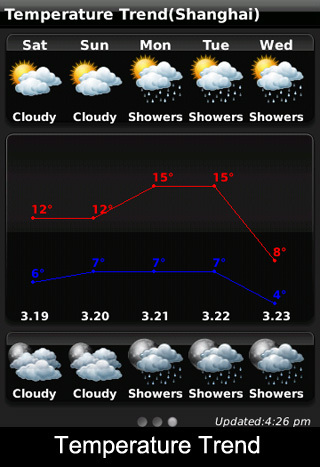 Or go our “Store” (Click the Navigation bar “Store", and click "Blackberry Tab";), Then find out "Weather Plus". If you want to purchase the full verison, please click the image "Pay with Paypal", and then in the new page, input your phone PIN number and Email, and done the payment process. If you want to experice the FREE trial at first, please click "Free Download", and input youe email address in the new page, then system will push the download link to you mail box immediately. MyPhone powered by S60 os, it turns S60 os phone into MyPhone UI. You can have a smart phone enhanced with TWO user interfaces. The best launcher ever! MyPhone 4 enhances your phone as a flexible & strong platform to play game and access internet, combining 4 popluar OS UI on your Nokia. 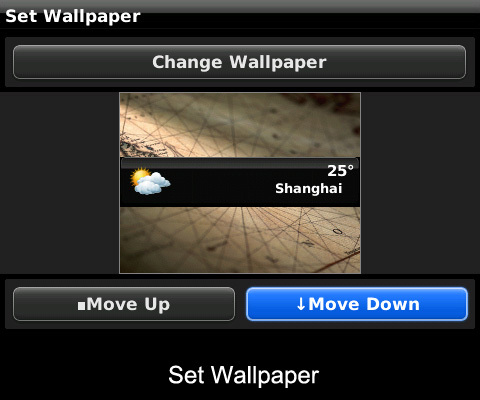 Fully emulate MyPhone UI in out look, move icons, changes icons. iStyle SMS conversation, you can schedule the SMS with senders list, easily to read or delete SMS. (only for S60 5th os). Add 3rd part icon by pick through list, no needing self input anymore. (only for S60 5th os) (Java application cannot launched). Set lock screen on/off by yourself. Freshing water drops wallpaper & dock. *Translation function needs network connection. Make sure you have a data plan. For some 3rd party applications, you can add it into menu by 'MyApp' function, or use 'Search' for quick launch, or switch back S60 UI to launch. This application is based on the Flash Lite platform, so it is based on the S60 UI with system limitations, eg, if you open contacts, it will go to original S60 contacts. In the MyPhone like SMS conversation model, your sending out sms can only in in real time sms progress, when you quit the conversation, your sending message will not display in the conversation list again. It means, MyPhone can not list your sent box's message in this version. The MyPhone like SMS conversation model can read all the incoming SMS, but can not mark it already read status. Too many messages may cause flash error:4. This is due to the limit of Flash memory. When installing to S60 3rd phones, you may have to revise as this: tools - App.mgr.- optional- settings:software installation(all),online certif.check(off). This will help you to solve and skip the "security warning" pop-up. Our APP is a passive content,it's safty and security. And it has been proved and tested by sample phones. After installed the file to your phone, there will be a icon on your phone's Installat. folder. A：You couldClick hereto purchase directly. Or go our “Store” (Click the Navigation bar “Store", and click "Nokia Tab";), Then find out "Photoclub". If you want to purchase the full verison, please click the image "Pay with Paypal", and then in the new page, input your phone PIN number and Email, and done the payment process. If you want to experice the FREE trial at first, please click "Free Download", and input youe email address in the new page, then system will push the download link to you mail box immediately.